What drives current? We can think of various devices—such as batteries, generators, wall outlets, and so on—which are necessary to maintain a current. All such devices create a potential difference and are loosely referred to as voltage sources. When a voltage source is connected to a conductor, it applies a potential difference V that creates an electric field. The electric field in turn exerts force on charges, causing current. According to the Ohm's law, "The electric current flowing through a conductor is directly proportional to the potential difference across its ends provided the physical conditions (temperature, dimensions, pressure) of the conductor remains the same." R depends upon the material, temperature and dimensions of the conductor. In S.I. units, the potential difference 'V' is measured in volt and the current 'I' in ampere, the resistance 'R' is measured in ohm. 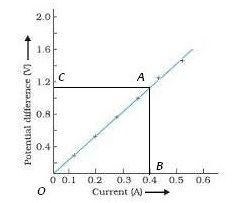 To establish the current-voltage relationship, it is to be shown that the ratio V / I remains constant for a given resistance and therefore a graph between the potential difference(V) and the current (I) must be a straight line. Here R is a constant. This gives the resistance per unit cm. 1. Draw the circuit diagram. 2. Arrange the required materials on the table. 3. Make the connections according to the circuit diagrams. 4. Determine the least count of the voltmeter and ammeter, and also note the zero error, if any. 5. Insert the key K, then slide the rheostat contact and see that the ammeter and voltmeter are working properly. 6. Adjust the sliding contact of the rheostat such that a small current passes through the resistance coil or the resistance wire. 7. Note down the value of the potential difference (V) from the voltmeter and current (I) from the ammeter. 8. Shift the rheostat contact slightly so that both the ammeter and voltmeter show full divisions readings. 9. 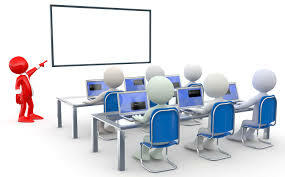 Record the readings of the voltmeter and ammeter. 10. In each case V/I is calculated, which gives the resistance R of the resistor and it is found as a constant. 11. Take at least six sets of independent observations. 12. Cut the resistance wire at the points where it leaves the terminals, stretch it and find its length by the meter scale. 13. A graph is drawn with I along the X-axis and V along the Y-axis. The graph obtained is a straight line. This also verifies Ohm’s law. 14. Note a particular point of current on X axis and extend a line joining the straight line and the point on Y axis. Mark these points. 15. Note the values of OB and AB then calculate the value of R as AB/OB. 16. Calculate the resistance per cm of the resistance wire can be found out by using the equation 2. Least count of ammeter = .......A. Least count of voltmeter = .......V.
Zero correction for ammeter, (-e1) = .......A. Zero correction for voltmeter, (-e2) = ......V.
Mean value of resistance, R = ....................ohms. Resistance per cm of the wire is ........................ Ω cm-1.